Cars, SUVs, vans, the elusive Lexus hybrids -- a range of taxi models compile New York City's famous yellow cab fleet. However, starting in October 2013, a more uniform set of taxis will begin replacing the hodgepodge that serves over 600,000 passengers per day. The New York City Taxi and Limousine Commission (TLC) has signed a contract that will make the Nissan NV 200 the city's exclusive Taxi of Tomorrow. During a public display last week, we had the chance to catch a glimpse of the new interior that offers several advanced features for optimal passenger safety and comfort. Several unique features set the new mini-van model apart from existing cabs. Passengers will be able to take advantage of a different view of the city through the moon roof. Rather than crooking your neck to catch the buildings as they pass by, the roof encourages riders to look up. The passenger section is equipped with a heat and AC adjustment panel, a USB outlet, and a 12V electrical plug for charging mobile phones and other devices. Passengers may also appreciate the grape phenol-coated air filter that improves cabin air quality and environmentally friendly, anti-microbial seat technology that kills 99 percent of germs and helps eliminate odors. Although the new model will be slightly larger than some cars, the 2.0L 4-cylinder engine is engineered to enhance the emission performance and fuel efficiency. The extra room includes a cargo area that has the capacity to fit four large pieces of luggage. Passengers will no longer have to jump over the central hump located on the floor of the middle seat of many cabs. A flat floor made of recycled tires is easy to clean, sturdy, and does not interrupt leg room. Several typical annoyances will be eliminated or at least diminished with the Nissan NV200 taxi. Bikers won’t be dodging swinging doors — the new model features sliding doors with a retractable step for easy entry and exit, as well as exterior lights that indicate when doors are opening. Noise pollution will also be minimized by a low-annoyance horn and exterior lights that call out obsessive, horn-prone cabbies who consistently rely on honking — whether they are daunted by this new feature remains to be seen! Passengers with such drivers can ride a little more relaxed as their taxi zips through the streets knowing that side curtain airbags and seat-mounted airbags for the front row provide a little extra cushioning if anything were to happen. The Nissan NV200 has been met with some resistance, as it is not wheelchair accessible and was not the public’s favorite model. The new fleet of cars is expected to hit the streets in October 2013. The first batch will introduce 2,500 to 3,000 cars and they will cost about the same as existing cabs. With New York City boasting the largest fleet of taxis in the US, the new model’s success could mean more cities may soon see similar models arriving to their streets. 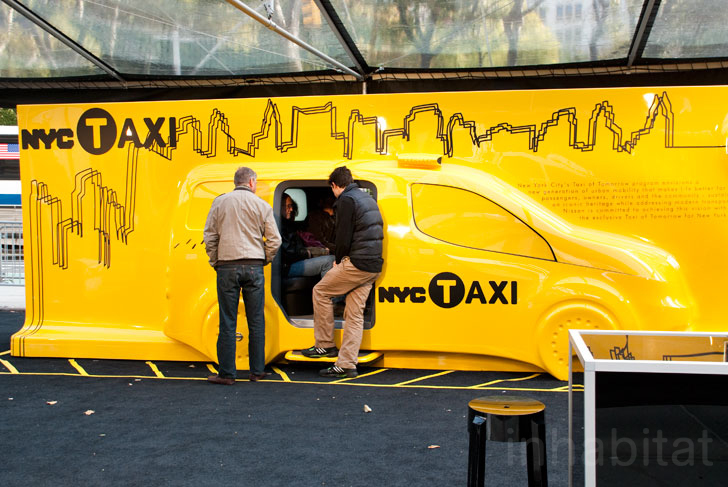 The Taxi of Tomorrow exhibit was open from from November 1-5, allowing the public to take its first peek at the new Nissan NV200 cab. The passenger section is equipped with a heat and AC adjustment panel, a USB and a 12V electrical plug for charging outlet for mobile phones and other devices. Anti-microbial seat technology kills 99% of germs and helps eliminate odors. Although the new model will be slightly larger than some cars, the 2.0L 4-cylinder engine is engineered to enhance the emission performance and fuel efficiency. A flat floor made of recycled tires is easy to clean, sturdy and does not interrupt leg room. The famous logo was set against a chalkboard where visitors could add their personal touch to the display.